Alexandre Lacazette and Pierre-Emerick Aubameyang have been phenomenal for Arsenal this season. Alexandre Lacazette arrived at the Emirates Stadium in the 2017 Summer transfer window and the gunners later signed Aubameyang in the 2018 January transfer window. It’s always not easy to make two good strikers happy at a club because each one will be trying to prove that he is better but these two have formed a great friendship. Aubameyang and Lacazette have been an iconic duo at Arsenal this season because they have both scored 24 goals for the gunners in this 2018/19 campaign. The Arsenal fans cried out to Unai Emery to be starting them together for a long time and he has finally bought that idea, Lacazette and Aubameyang usually compliment and link up well on the pitch in the attacking moments. Pierre-Emerick Aubameyang recently had an exclusive interview with Sky Sports and he said that he hopes that the boss continues playing them together in a formation which allows them to play as strikers. The Gabon international also explained how they link up together when they are both on the pitch. “When one comes to the ball, the other goes deep. It’s about filling in. You lift your head up and see he is going into space, it’s about feeling as well. If we have to give the ball to a guy in better space, you have to give him the ball. That’s what happens between us.” said Aubameyang. 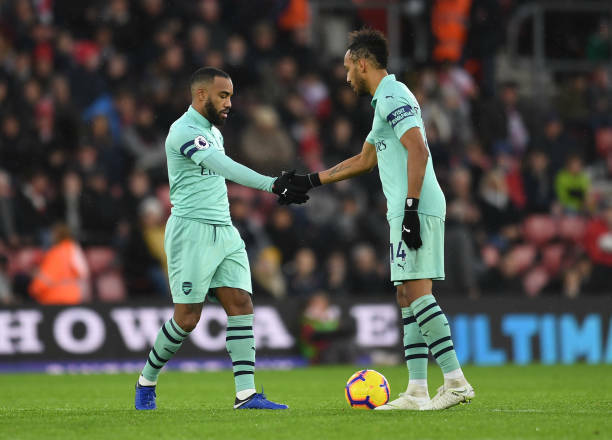 The gunners will be hoping that Lacazette and Aubameyang continue their partnership on the pitch because they have helped the gunners a lot this season. And none of them having thoughts of leaving will depend on the coach including them together on the pitch.